Ronald Ansell was in the 129 Field Regiment. 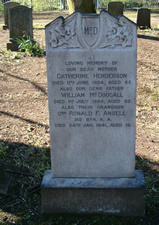 He died on 24th January 1941 and is buried in Saughton Cemetery. His name is on the WW2 memorial at St Michael’s Church. The inscription reads:Loving memory of our dear mother Catherine Henderson …. also our dear father William McDougall …. also their grandson Cnr. Ronald F Ansell 312 Btr. R.A. Died 24th January 1941, aged 19.